If you've ever read the ingredients list on various pet food brands, you may have noticed that the vast majority of them contain corn or other grains. It's never been a secret that cats and dogs are carnivores, so why is corn added to their food? There are two opposite opinions about it. Pet food manufacturers claim corn is a very nutritious ingredient and an excellent source of energy, while pet owners and breeders keep questioning these statements. They link corn and other grains to many health ailments such as allergy, excessive shedding, dandruff, itchy skin, flatulence, loose stools, diabetes, kidney and liver diseases, Inflammatory Bowel Disease (IBD), obesity, and joint disorders. This list can be continued. How can we know where the truth lies? Let's try to use common sense and some scientific facts. At first glance, the statement about corn being a better energy source seems correct because it contains more calories. However, this is greatly misleading. Mother Nature has designed cats and dogs to satisfy their nutritional needs by the consumption of large amounts of animal-based proteins (meat, organs). They are supposed to derive much less nutritional support from plant-based proteins (grains, vegetables). Pets lack specific enzymes and therefore cannot digest plant proteins as efficiently as animal proteins, let alone carbohydrates. In other words, the amount of nutrients a pet will assimilate from corn is always going to be lower than what's indicated on the label (in the table above). Manufacturers claim that whole corn broken by grinding becomes more than 91% digestible. It's really so... for humans. For pets, it doesn't change the fact they lack the specific enzymes allowing them to digest plant-based proteins. It doesn't matter in what form, whole or processed, plant-based proteins (grains) come. They remain plant-based anyway, and therefore can't be assimilated as efficiently as animal-based proteins. Grains from the stomach of a prey animal are basically the only type of grains cats and dogs are meant to utilize because those grains have already been pre-digested by the prey animal's enzymes. Now let's have a look at the table again. Since pets are not built to efficiently digest corn proteins and carbohydrates, the benefit they'll receive from eating corn is going to be much poorer than what they'll receive from eating meat that is low in carbohydrates but rich in animal-based protein. This is, by the way, a likely explanation why pets who are fed grain-based diets eat and poop more than those on raw or grain-free diets. They simply can't efficiently digest most of the nutrients they consume, hence they need more food to satisfy their daily needs, and therefore the organism gets rid of the unutilized "rubbish" in a natural way. Pets who are fed grain-free diets eat and poop less because what they eat is efficiently used by the organism. It's also worth mentioning that many holistic veterinarians believe high carbohydrate diets to be the main cause of a lot of chronic diseases in pets. It's been reported that many pets have been able to stop taking their medications after they were switched from a grain-based to a raw diet. In addition, there are lots of reports by pet owners that have noticed a drastic improvement in their pet's coat condition after they abandoned a grain-based diet. Don't such facts speak for themselves? Supporters of corn-based products point out that corn is one of the least allergenic ingredients in pet food. This is probably true, yet one should never fully rely on the accuracy of studies confirming this fact because it's often quite difficult to determine precise incidence of food allergies in pets. Allergies can show themselves in many different ways, and the researches may intentionally or unintentionally miss allergy signs. Even if corn (not genetically modified corn, read about GM corn below) itself may be low in allergens, there's a very real issue of cereal grain quality. The best corn is usually delivered to the human food market, while no one really knows how good the quality of the grains is that are delivered to the pet food market. Pets can develop allergies to the contaminants in the grain such as herbicides and toxins from mould and fungi. A few words about GM corn. 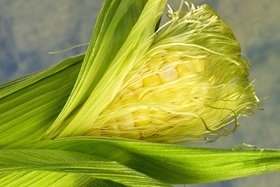 According to different sources, up to 80-90% of corn produced in the USA nowadays is genetically modified. That means corn (and probably other crops such as soybeans) used in commercial pet food is most certainly genetically modified. GM products have been linked to many diseases in humans and animals. Allergy is only one of these diseases. Supporters of grain-based diets claim that corn has a low Glycemic Index (GI). Glycemic Index shows how certain foods affect blood sugar level. The higher the index, the greater the risk of an unhealthy rise in blood sugar, and therefore in insulin response. A Glycemic value over 50 (some say 60) is considered to be high. Corn is know to have average GI of 54. It isn't really low. Moreover, only products high in carbohydrates are known to increase blood sugar level. Meats are extremely low in carbohydrates, and thus they don't increase your pet's blood sugar level! As a result, grain-free and raw diets are much better to prevent many health issues including diabetes. How much corn is in pet food? That depends on the manufacturer. It may seem that, knowing all the facts listed above, manufacturers won't add much corn and other grains to pet food. Sadly, this is not the case. You can easily check it by looking at the ingredients list. There are special labelling requirements for pet food, and they state ingredients must be listed in descending order of weight. If you see "corn" or "rice" listed first, that means grains constitute most of the pet food weight. Few people notice that, but grains are listen first on most commercial pet food. Why is corn added to pet food? The answer is simple. It's a cheap filler manufacturers use to decrease the overall cost of the food and therefore keep their positions on the market. While writing this article, we stumbled upon an interesting interpretation of the conception of "fillers" used by manufacturers. It was stated that fillers have no nutritional value, and since corn does have nutritional value, it is not a filler. It's convincing at first glance, isn't it? The problem is, corn may have nutritional value for humans, but, as it's been discussed above, pets cannot benefit from grain matter the way humans do simply because their digestive system work differently (read about a lack of specific enzymes in the "Nutritional value" chapter). For pets, corn and other grains have much lower nutritional value. Therefore they are fillers no matter how manufacturers want to mask this fact. Please carefully choose your pet's food. Although it's never too late to switch your companion to a healthier diet, doing it right from the very beginning can help prevent many health problems, and it will also save you from lots of stress, anxiety, and vet bills. If you choose its diet considerably, your pet will live a happier and longer life. How To Cope With Pet Loss? How Do You Find A Lost Cat Or Dog?